The robots own Appalachia now. As gun-toting tourists wander the war-blasted roads of post-apocalyptic West Virginia—in occasional small flocks, but more often alone—the bots stand sentinel, floating through abandoned homes, operating stores, and occasionally, sending these fleshy interlopers on largely meaningless errands. In a hellish culmination of every automation-phobe’s worst nightmare, the robots haven’t just taken all the jobs in Fallout 76’s rural world; they’re giving them out now, too. At this point, the problems plaguing Bethesda Softworks’ second foray into the massively multiplayer market—and its first attempt to extend that framework to Fallout, a series that has frequently derived much of its power from solitude—have been well-documented. Fallout 76 is buggy as hell, but even when it’s working optimally, the design flaws are evident and in abundance. Enemies spawn unpredictably into the game world, often teleporting into a location en masse in a big, well-armed glob, like a flash mob of highly radioactive death. Systems are obtuse and poorly documented, especially in relation to the game’s much-touted crafting mechanics. And progression feels uniquely aimless; you can be cruising through a beautiful portion of West Virginian countryside, confidently putting mutated honeybees and radiation orcs in the ground, only to walk over a seemingly innocuous ridge and find yourself in a fight with an enemy twice your level and three times as nasty. The question that comes up every time you encounter this recurring narrative—and, again, it’s everywhere, from opulent resort hotels, to the last missives of unionizing miners burned away by the bombs, to bullying robotic carnival barkers—is whether Bethesda realizes that it’s engaging in an almost flagellating degree of self-criticism in the process. After all, the game’s automation theme was presumably chosen not just because it fits Fallout’s greater fiction, but because it also makes it easier for designers to execute their vision of a world entirely devoid of human characters outside a player’s control. Even as you pick up audio logs, newspaper articles, and all the other storytelling detritus of a human-free world—all screaming about the evils of automation—the game itself embraces its easy conveniences with a terrifying fervor. Fallout has always excelled at indirect and environmental storytelling, so who needs to write a lot of tricky dialogue choices and branching story paths when a soulless robot can take all that work off your hands? The disconnect between the anti-automation narrative, and the actual experience of playing Fallout 76, ends up feeling surreal. 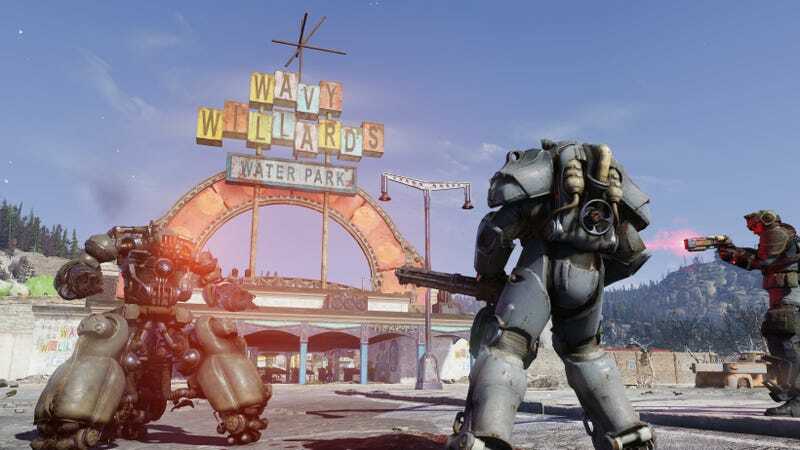 If that dislocation was intentional, Fallout 76 would verge on brilliance (if not actual fun). What better way to highlight the emptiness of a purely automated world, devoid of the human touch, than to create an RPG where single-serving quests are doled out mindlessly by machines? For all their imagery of mushroom clouds and subterranean bomb shelters, Fallout games have never been about the bombs, but what grows in their wake. If you squint enough, 76 can seem like an iteration upon that theme, a suggestion that nothing grows in the aftermath of a nuclear bomb, because robots are the only things left. But very little about Fallout 76’s world design suggests that the people making it understood that they were crafting a multi-million-dollar self-own. A charitable read of the game’s initial press hints that the studio might have legitimately thought its players would fill in the spaces they were intentionally leaving blank, engaging in its (largely non-existent) economy and enacting the “Reclamation Day” of its Vault-opening mythology, despite the fact that the game goes out of its way to make building anything more complex than a lone cabin in the woods impossible. If Bethesda thought a legion of players trained for solitary wandering by years of better games might collectively come together and make something transcendent, despite itself, that miracle doesn’t seem to have materialized just yet. Maybe some ambitious, No Man’s Sky-style patch a year from now will save it, make its community-building aspects tantalizing enough to draw players in, and reconcile its narrative hatred of cheap automated production with its own reliance on the same. Until then, though, the robots watch. Trapped in pointless routines, they wander through a broken wasteland, scrambling for purpose, but lacking an essential human spark. They ask people to do things, but can’t provide a meaningful reason why, waiting for some sort of world-saving systems upgrade that’ll probably never come.